How can one function when they're subjected to images like this? Someone get a mop and bucket, please. I've melted into a puddle from the ridiculous cuteness. I want one, bad. French Bulldogs are just so stinking cute. i like how you call it the army call. i call it the frogleg crawl. either way, mollie and sirius are cute. and so is this dog. 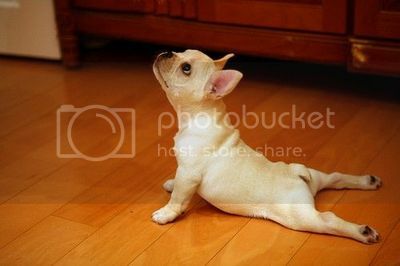 oh geez, the french bulldog is cute.